This Morning Song - Simon Bull tapestry shows a gorgeous white magnolia, based on the work of renowned artist Simon Bull. In this sumptuous work, we see the white flower in a morning light with colors of blue, pinks and purples variegating the white petals of the magnolia. The art work of Bull shows balance of color and composition and is often a celebration of the beauty of flowers. His works of well known through celebrity circles as well as art critics. Here we see the typical play of flowers close up for an enchanting effect. 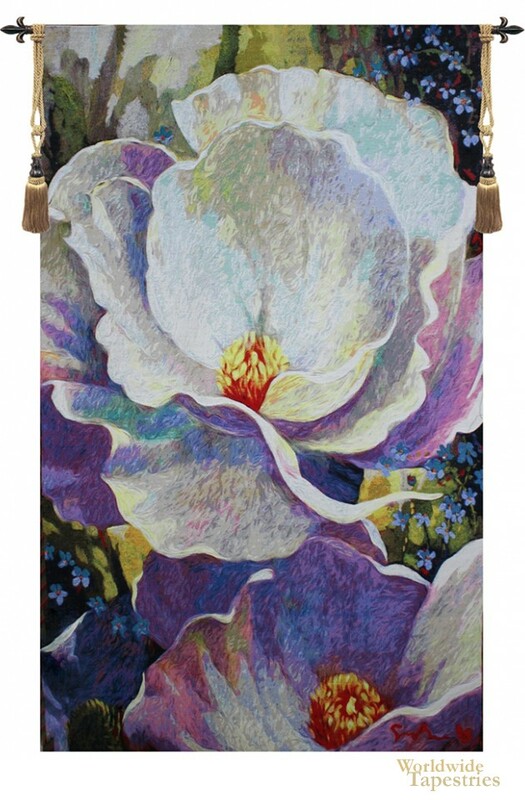 This modern floral tapestry Morning Song - Simon Bull, is backed with a lining and a tunnel for easy hanging. Note: tapestry rods and tassels, where pictured, are not included in the price. Dimensions: W 36" x H 64"